SP34-B (Huerfano Butte - Central Dike). Monzonite. This rock is holocrystalline, phaneritic, medium- to coarse-grained, hypidiomorphic-granular. All crystals are subhedral except pseudoleucite, carbonate, and opaque minerals, which are subhedral to anhedral. The following are present as phenocryst phases: biotite (1-3 mm) and phlogopite; acicular aegerine-augite (1-4 mm); titanaugite (1-4 mm); plagioclase (1-4 mm) is heavily altered to fine-grained phyllosilicates; potassium feldspar (1-4 mm); opaques (1< mm); carbonate (<1 mm); apatite (<.1 mm); sphene (.1 mm); analcite (<1 mm); pseudoleucite (1 mm) is present as a mass of subhedral nepheline and potassium feldspar crystals. Biotite was the phase dated. SP34-ts (Huerfano Butte - outer portion). Alkali Gabbro. This rock is holocrystalline, porphyritic-aphanitic with medium- to fine-grained anhedral to subhedral phenocrysts in a grey groundmass (25%) of very fine-grained feldspars and mica. All crystals are subhedral except olivine, fluorite, and opaque minerals, which are subhedral to anhedral. 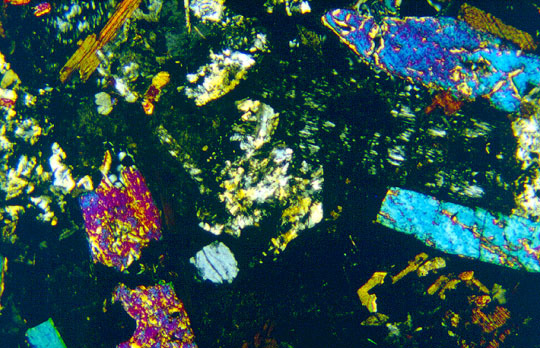 The following are present as phenocryst phases: olivine (.5-3 mm) exhibits minor alteration to iddingsite; opaques (<1 mm) appear spatially associated and/or as inclusions in the olivine; biotite (<1 mm); plagioclase and potassium feldspar (.5-1 mm); orthopyroxene and titanaugite (.5-2 mm) occur with some of the latter exhibiting one or more of sector zonation, oscillatory zonation, and sieve texture; apatite (<1 mm). Fluorite appears to have replaced iddingsite. Overall texture is intergranular. Biotite was the phase dated.